Travelers who want the best of central Italy are now heading for Le Marche, the third region, alongside Tuscany and Umbria that makes up the area. The region lies on the eastern side of central Italy, between the Adriatic Sea and the high Apennine mountains. Much of it remains unspoiled by mass tourism. The Adriatic coast has been known as a sun and beach mecca for years. However, inland, perhaps more so than anywhere else in central Italy, you will find places where time really has stood still. From our farmhouse it's just a short drive to Urbino or to the Adriatic Sea! Adriatic Highway A14 to the Fano exit. Continue on Super Strada, direction Roma, to the Acqualagna exit. Continue for Piobbico on S.S. 257. At the center of Piobbico, turn RIGHT and take the provincial road for Urbania for about 4 km. Pass thru the suburb of Piano, then just past Locanda Val Pietro, turn LEFT at the blue sign for Via Candigliano. (You'll see our big yellow sign). Keep to the right at the fork and follow the signs for "La Tavola Marche Agriturimo Ca’Camone." Continue for just over 6km (when you think you have gone too far, you are almost there!) “Ca’Camone” our big stone farmhouse is on the right side of the road. Guests should be aware that a car is pretty much essential while staying at La Tavola Marche. La Tavola Marche has partnered with Auto Europe to give you the best car rental rates available. We hope this helps to make your holiday and travel plans a bit easier for your arrival at La Tavola Marche. Fano, Citta di Castello, Pesaro & Ancona are the closest train stations with car rentals available in the area. When it comes to the classical and most time-honored of culinary traditions, you will find that the cucina povera is simply the best. Cucina povera are dishes that have rural, peasant roots. What better place to share a love for food than the beautiful region of Le Marche with a perfect balance of coastal fruits of the sea, intensively farmed midlands, and the wild harvest of the mountains. Along the coast, seafood is abundantly available. Inland and north from the coast, game flourishes. Truffles grow happily on the roots of old oaks. In addition, wild boar, which ends up in marvelous ragù and sausages, fatten on the acorns of this ancient forest. Between the mountains and the sea, there are gently rolling hills rich in farro and wheat, peaches and plums, tomatoes, garlic, fennel, basil, lavender, and rosemary. On the farms, pigs, chickens, turkeys, ducks, and cattle all fatten on the grasses of Le Marche. This variety typifies the region and why it is the perfect place on earth. The area is predominantly pork, cheese, mushroom, and truffle country. Most villages and towns host a weekly market that is an invaluable source for buying fresh food at more competitive prices. The Le Marche region produces a large range of wine, including 13 varieties of DOC designated wines. If you appreciate good, wholesome food, you will discover many gastronomic pleasures at La Tavola Marche. La Tavola Marche is located in the heart of a truffle valley. Truffles are weight for weight, one of the most expensive foods on the planet. Luckily, however, a little goes a long way and in Le Marche you can indulge in them without pawning the family silver. At La Tavola Marche, our oak trees hide these culinary diamonds, just waiting to be discovered. There are numerous species of tartufi, but the two types worth killing for are the tartufo bianco or white truffles and the tartufo nero or black truffle. The white is the finest and the costliest; tartufo bianchi can cost well over $3,000 a kilo depending on the quality and seasonal abundance. The black truffle is much more affordable. Both add a touch of luxury to any meal. Most Italians don't acknowledge the sub-par truffle oil found in the United States; the only way to serve them is fresh, shaved over pasta. Plan to visit Le Marche in October or November and then again at the end of December for the white truffles and between December and March for the black truffles to taste them fresh. In the summer any fresh truffles to be found on restaurant menus will be the tartufo d'estate or summer truffle, a pale shadow of its noble sisters. If these are your only experience tasting truffles, you may wonder what all the fuss is about. Italian truffle hunters dig up around 100 metric tons of truffles a year with the help of the dogs and pigs specially trained for the job. While in Le Marche, Acqualange, Sant'Agata Feltria and our very own Sant'Angelo in Vado are the places to head during the truffle season. There are many many festivals to celebrate these prized treasures. Sant’Angelo in Vado, with its impressive Cathedral and Reason’s Palace, is worth visiting. It is known as the Truffle Capital (along with Aqualanga) and hosts an international white truffle festival every autumn. The Via Flaminia leads all the way from Rome to Fossombrone, whose churches are filled with works of art, the monumental Library, museums, Ducal Palace, and the Renaissance High Court. Close by is Fermignano, home of Bramante, and with extremely interesting and beautiful Roman bridge and medieval tower. Continuing along this path will lead to Urbania with its seven bridges, museums, and numerous churches. The 14th century village has almost intact fortifications. Its history of ceramic production was once renowned and today they still make splendid majolica and wrought iron crafts. Nearby Mercatello sul Metauro conserves its past with houses and lovely lanes dating back to the Middle Ages. The Church of San Francesco holds a real anthology of 14th–17th century paintings from central Italy. 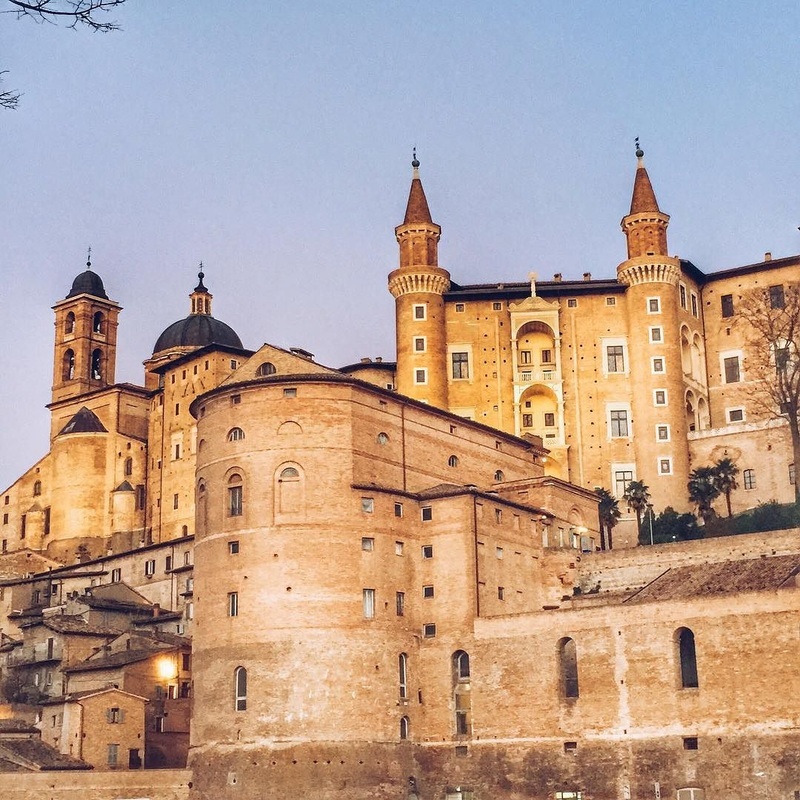 Urbino remains one of the most important towns in the Marche—indeed in Italy—for the tourist in search of great Italian art and architecture and its beguiling streets well reward the curious traveler. Since 1998, its centro storico has been designated a UNESCO World Heritage Site. For the second half of the 15th century, Urbino's windy hill was the setting for one of the most illustrious courts in Europe. Duke Federico da Montefeltro gathered around him the greatest painters, poets, and scholars and housed them in one of Italy’s most beautiful Renaissance palaces, a palace that still stands as an eloquent memorial to this quintessential Renaissance man. Gubbio, typical medieval city with houses and palazzi still intact, can be reached by car in 30 minutes. The castle of Gradara, San Marino, Cagli and Mondavio are all close by, easily reached by car and well worth a visit. Piobbico, with the impressive Brancaleone Castle, Apecchio with the Ubaldini Palazzo and annexed fossil museum full of interesting finds and curiosities, and Sant’Angelo in Vado are close by and provide interesting itineraries. All of these small, inviting towns, where the ancient traditions of the typical umbro-marchigiano culture are still alive, offer typical, characteristic restaurants where the visitor can enjoy the local, traditional specialties.